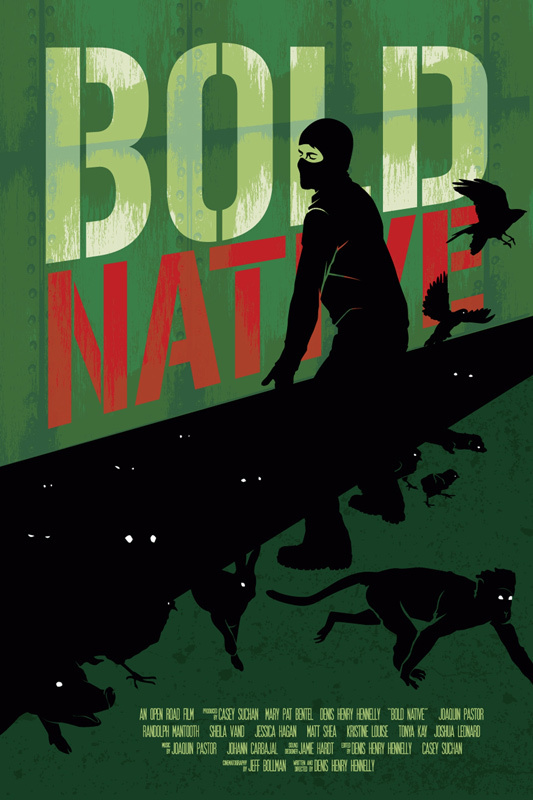 Huntsville Vegans will host a screening of the movie Bold Native on Thursday, February 9th, 2012, at 6PM. This event will take place in the main auditorium on the 1st floor of the Main Library downtown. Special guest speaker Peter Young will speak about animal liberation, the film, and the AETA. This event is 100% free and is open to the public. Join us for a free class on Plant-Based Nutrition at the Huntsville-Madison County Public Library in downtown Huntsville on Thursday January 26th! The class starts at 5:30 pm and will be in the Computer Training Center on the 2nd floor. Mike Cross of Huntsville Vegans will go over the basics and share links to nutrition and lifestyle resources online, and how to use some key sites and services, including: health and nutrition tracking sites, recipe searching sites, pages for medical and nutrition information, and how to subscribe to podcasts in itunes and blogs in google reader. The only thing you need to bring is yourself. You should have some basic computer skills, be able to check your email and go to specific websites, and be able to follow on-screen instructions to install new programs. This event is hosted by the Huntsville Public Library and space is limited to 24 people! Please do not RSVP if you will not attend this class. If you *would* like to go, please let us know on our Facebook Event Page, and then call the library’s Computer Training Center at (256) 532-2356 and tell them that you want to attend the Online Plant-Based Nutrition class on January 26th. If you don’t call the library you may not be able to attend. They’ll let you know if space in the class is becoming scarce. 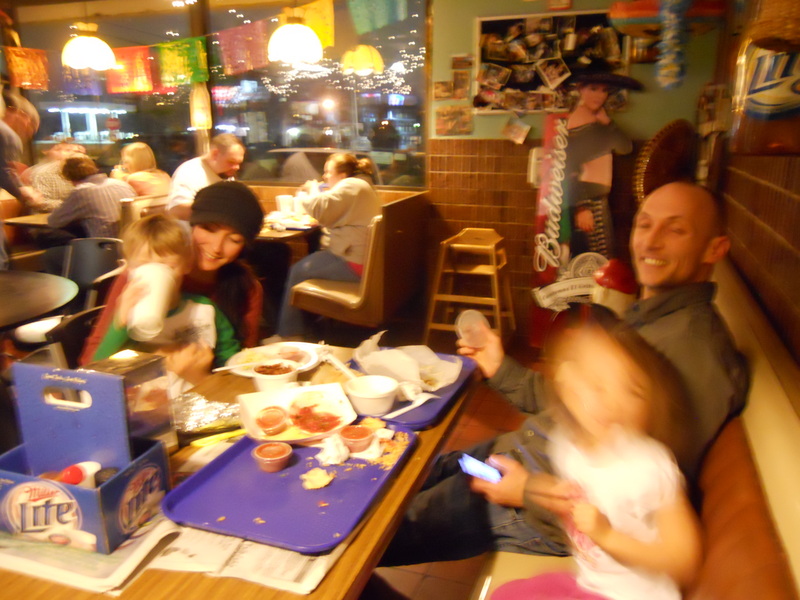 On Saturday, January 21, 2012, members of Huntsville Vegans ate together at Bandito Burrito on Governor’s Drive as part of our Restaurant Smash series of events. The purpose of a Restaurant Smash is to show local restaurants that there is a growing number of vegan consumers in Huntsville. For many of us, Bandito Burrito had been a favorite restaurant. Many members of our group had been eating at Bandito 3 – 5 times a week. Then we found out that Bandito uses whey in their refried beans. This was really disappointing for those of us that had been loyal Bandito customers, because we had previously been assured by Bandito staff that the refried beans were vegan. This dish is small, so you might want to get two of them or pair them with another dish. 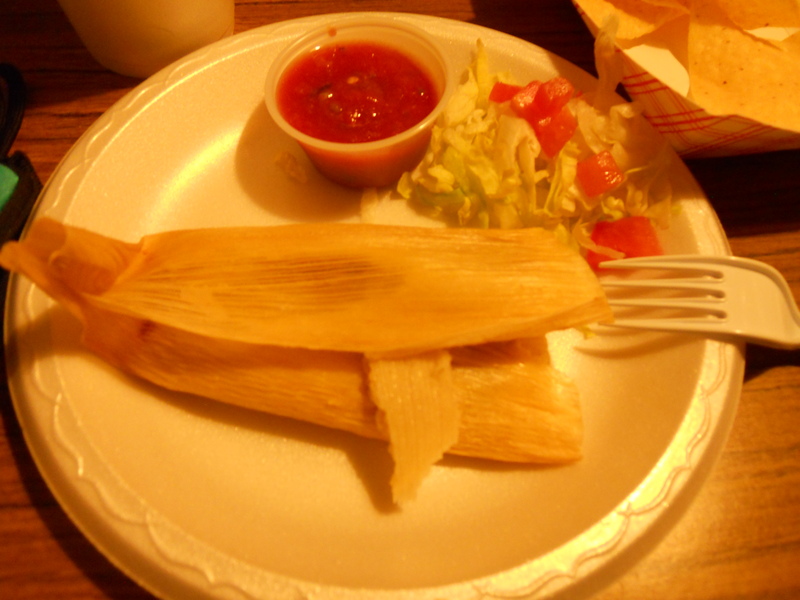 You don’t have to make any special orders – the veggie tamale is vegan as is! 🙂 Woot! 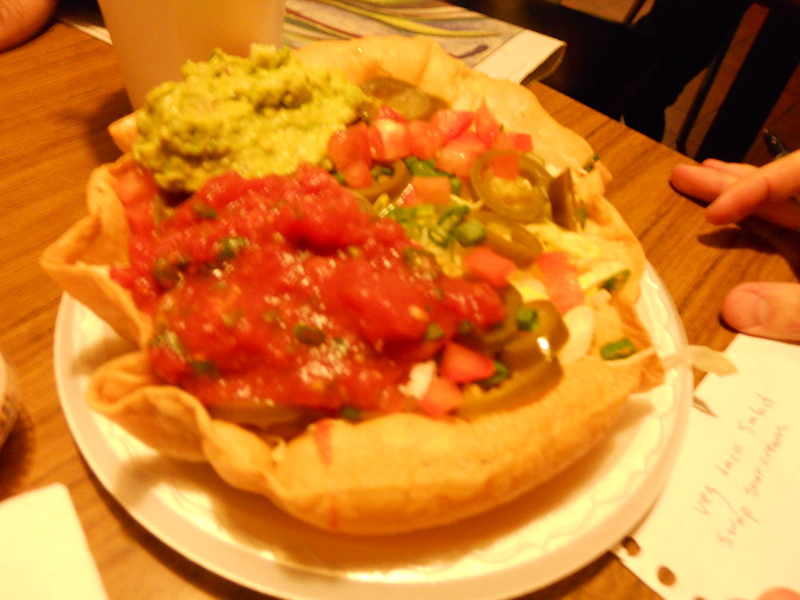 Be sure to ask for whole pinto beans instead of refried beans. Ask for no cheese, and to substitute guacamole for the sour cream. If you like spicy, then it is great to add jalapenos as well. This dish will fill you up. It’s a great meal. At our restaurant smash, the manager on duty, Steve, was extremely helpful. He’s promised that they’ll work with us to have more vegan options on the menu. We’d like to give a big THANK YOU shout out to Bandito Burrito for working with us to bring more vegan options to the Huntsville community! Join us on Tuesday, January 17th at 6:30PM for our discussion of the first two parts of Gary Francione’s The Animal Rights Debate: Abolition or Regulation? Our discussion will be held at Lucy’s house, so please email us at huntsvilleveg@gmail.com for directions. 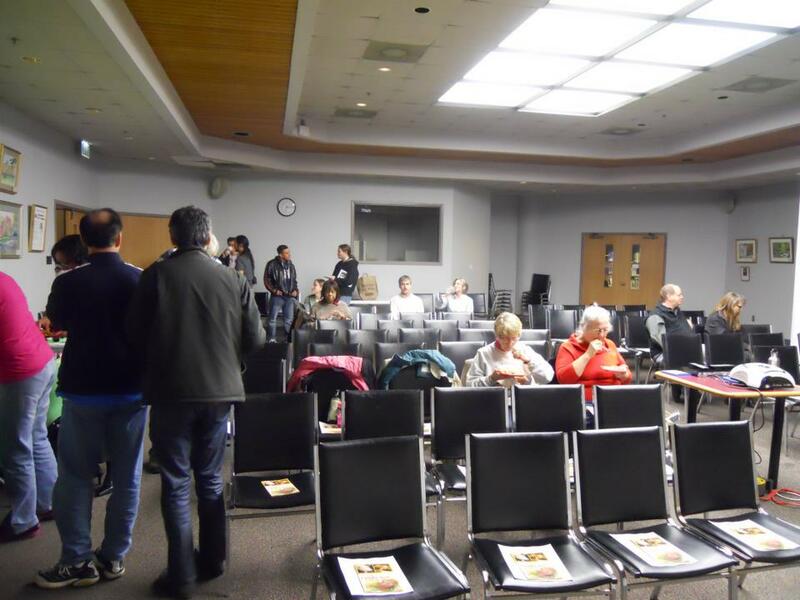 On Thursday, January 12th, Huntsville Vegans hosted a screening of the film Forks Over Knives at the Main Library. Despite the freezing temperatures and snow, we had 21 participants at this event. Everyone who attended was given Vegan Outreach’s Guide to Cruelty Free Eating as well as information from PCRM. Thanks to our members, we were able to share a variety of vegan food. From Natalia’s delicious samosas to Carole’s amazing dessert, there was a wealth of healthy food for those considering a plant-based diet to try. Before the screening, Alex Graff gave a short talk on the importance of a proactive approach to health. We received great feedback from this event, with more than one audience member telling us that the movie was an eye-opening experience. Our aim in hosting health-based events is to support our community by offering education and support as people transition to a plant-based diet. If you have any questions about going vegan please email us at huntsvilleveg@gmail.com. You can also join our online community on Facebook at http://www.facebook.com/huntsville.vegans.